Each Wednesday I like to share a recipe for you and your busy family. Hopefully it is something that is easy, healthy, and yummy. I'm thinking about turning this into a linky each Wednesday where others can share posts about what they have been cooking in their homes each week. If you would care to participate, leave me a comment - maybe I'll try it out in the next few weeks. Today's recipe comes from one of my favorite sources, Cooking Light. I recently found that Cooking Light and Southern Living have a recipe site called MyRecipes.com. 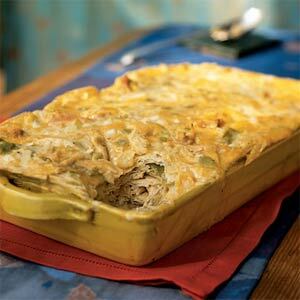 Here is the link to Green Chile Chicken Casserole - you will LOVE it. It's a little bit of work, but you could get your children helping you (it's all about patterns and layers) and it would go faster. I made this on Saturday evening and we still have leftovers - it is great for your husband to take to work for lunch, or great for a cold, rainy day lunch at home, too. I hope you enjoy the recipe!